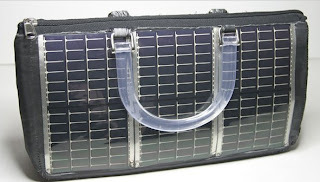 This bag is plated with solar cells. It generates enough power to charge a cell phone, iPod, or camera. One of Tony Green’s word sculptures. If you’re intrigued, be sure to visit accumulations, a site I check often.